The Daiwa NEO tenkara rods really should be two different series because the 5:5 "Level Line" rods and the 7:3 "Level or Tapered line" rods are so very different. The 5:5 model is a relatively soft, smooth casting, full flex rod that spreads the bend over much of the rod. It will do very nicely with a size 3 or 3.5 level fluorocarbon line. The LL32SC is a 16 penny rod, making it just a little bit stiffer than the Ito or the Daiwa Enshou LL36SF and a little bit softer than the Shimotsuke Mai or the Nissin Pro Square 360 7:3. The 7:3 model (LT33SC) is a 28 penny rod. That's equal to the Daiwa Enshou LT36SF, the Shimano Kozuka 33NT and the Suntech Suikei (stiff). For people who like the pinpoint precision of casting a heavier furled line, the Daiwa NEO LT33SC is a good choice. For those who prefer level lines, the LT will also cast a size 4 or 4.5. 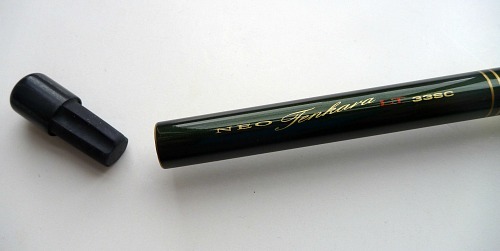 The bend profile is different than the Enshou or Suikei, though, which have softer tips but firmer mid sections. The LT33SC rods are firm all the way to the tip (which is what makes them so well suited for heavy nymphs). I like the silky smooth 5:5 level line rod. I try to use the lightest line possible and generally fish unweighted or very lightly weighted flies. If you want Daiwa quality in a shorter full flex rod, this is the one. The LT rods, though, may be the best tenkara rods there are for fishing weighted nymphs. There are references all over this site about keiryu rods being better than tenkara rods for fishing nymphs. 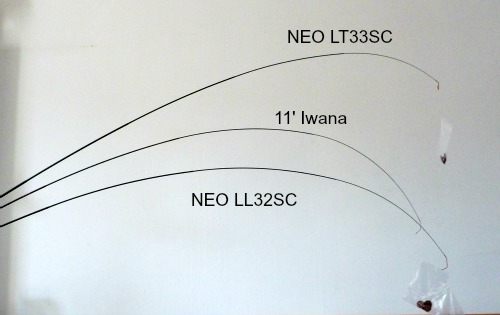 The Daiwa NEO LT33SC rod are the exceptions. They have the stiffness you need to get good hook sets when fishing weighted nymphs. I recently saw a video that examined what the average fly fisherman could learn from competition anglers. I'm not a competition angler and am not particularly interested in the competitions, but competitions will up your game. And even if you think competition has no place in fly fishing, you can learn from competition anglers. 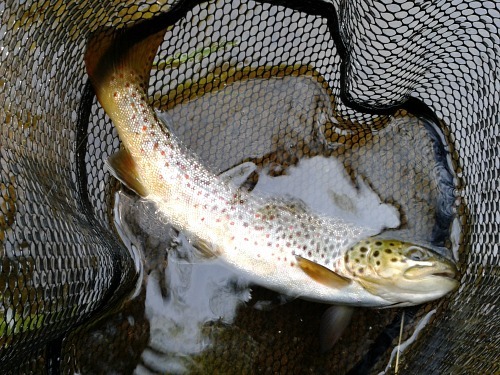 Fly fishing competitions are won by fishing weighted nymphs. Maybe not every single one, but by far the vast majority. It pretty much makes sense that if you want to catch more fish, fishing a weighted nymph or two is the most obvious first step. Aaron E's first time out with his Daiwa NEO. Watching the video, it is pretty clear that there are some close similarities between competition anglers and tenkara anglers. The competition anglers fish a short, tight line, rely on movement (or hesitation) in the line for strike detection, and have no use for their reel other than to comply with rules that require them to have one. When tenkara rods first reached these shores, everyone seemed to think they'd make great Czech nymphing rods. Sadly, they didn't. Their tips were too soft. I've fished a lot of tenkara rods from a lot of different makers and for years now I've recommended keiryu rods for fishing weighted nymphs, particularly the Daiwa Kiyose SF and the Shimano Kozuka NT. Somehow, the Daiwa NEO LT tenkara rods got left out of the spotlight but they are great nymphing rods. The LL32SC is too soft for nymphing, but makes a great wet fly rod. The tip plug is virtually identical to the plugs on the high end Enshou series - a wood and rubber plug with sufficient fluting to easily insert the plug for safety while keeping your line attached to the rod. With these rods, there isn't any need for one of the bulky "universal plugs." The rods are a finished in a very nice green color, with just enough accents to be classy without being gaudy. The grip screw cap is metal and has a coin slot for tightening or loosening. When tightened, the outside flange of the cap butts up against the cork of the grip, which should keep it from being lost while you are on the stream. The cap also has a rubber insert to keep the rod from making the clacking noise some rods do when collapsed. There is no ventilation hole but even if it had one I would recommend fully disassembling the rod after use so it can dry thoroughly. As with other Daiwa rods, replacement parts are available. Length collapsed - 19 3/8"
Length collapsed - 16 3/4"
I no longer carry the NEO tenkara rods. The Daiwa Expert LL rods are so much better for level lines, and the Suntech Genryuko rods are nicer rods for Czech nymphing. Hi Chris ..had a chance to fish the Neo [LL32SC] on a small stream. Love it. Pairs nicely with the 330 Enshou [LT33SF]...kind of an all terrain brace of rods. Hey Chris, thanks for the great rod and service. That's a wild brown I got with the Neo first time out in New York by Canadian border.